The ability of the body to turn protein into muscle does not diminish as we age. Elderly people need to grow and maintain muscle for general wellness and also arterial health. As people age they may unknowingly decrease their intake of this important energy source for a variety of reasons. This may be due to changing tastes, difficulty chewing (meat and poultry are primary sources), difficulty digesting, or cost of food. Most American diets have more than enough protein and deficiency is rare, but we need to be conscious of our daily needs. The US RDA is high, to cover most person's needs. For example, the average requirement is 0.6 grams of protein per kilogram [2.2 pounds] of ideal body weight, while the RDA is 0.8 grams per kilogram of ideal body weight. So the RDA has a wide built-in safety margin. An adult female whose best weight is 110 pounds, or 50 kilograms, needs about 40 grams a day. An adult male who should weigh about 154 pounds, or 70 kilograms, requires about 56 grams daily. 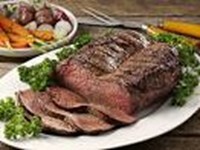 A 6-ounce portion of lean roast beef is a great source; 38 grams worth. But it also delivers 44 grams of fat, 16 of them saturated. That's almost three-fourths of the recommended daily intake for saturated fat . The same amount of salmon gives you 34 grams of protein and 18 grams of fat, 4 of them saturated. A cup of cooked lentils has 18 grams , but under 1 gram of fat. Obviously choice of sources is very important. Seafood is one of the best sources because it's usually low in fat. Fish such as salmon is a little higher in fat but it is the heart-healthy kind: omega-3 fatty acids. White meat of poultry is an excellent lean source. Dark meat is higher in fat. All poultry skin is loaded with saturated fat, so remove it before cooking. Lean beef has only one more gram of saturated fat than a skinless chicken breast. It is also an excellent source of zinc, iron and vitamin B12. Lean pork is now considered a white meat and is low in saturated fat. Dairy products such as milk, cheese and yogurt have the added benefit of being rich in calcium. Eggs are a good source and are not the heart-health issue they used to be. An average of one egg a day is acceptable. Beans, nuts, and whole grains, are excellent choices, and they offer healthy fiber, vitamins and minerals. Tofu and other soy foods are an excellent red meat alternative. Tempeh, also from soy is a healthier product than tofu. Rice and bulgur, whole grains, are excellent choices and are diet staples throughout much of the world. Whey is a high quality product which comes from cow's milk and contains many of the same components found in mother's milk. It supplies essential amino acids, is easily digested, and efficiently used by the body. Casein also comes from milk and is high in amino acids and slow digesting. Powdered supplements supplements are available in a variety of compositions. They are mostly used by athletes and body builders. Seniors should consider using supplements only if they are unable to have a whole food, healthy diet. For older people without adequate protein in their diets unhealthy things can happen. Vital organ systems like the heart and lungs slow down, becoming incapable of further exertion. Neural processes like thought, planning and cognition are also affected. The immune system becomes weak, exhibiting a delay and difficultly in dealing with infections. Wound healing and repair, which requires a constant supply of amino acids, is also compromised.